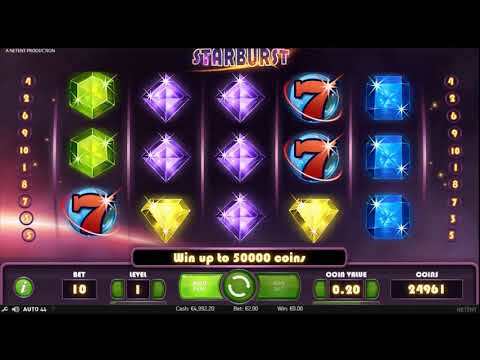 The Starburst slot was created by Net Entertainment and gives you a glimpse of the vastness of space. With the edge of a planet and stars that move gently in the background, you can really admire the beauty of the coloured neon gems as they spin on the reels and create winnings along the paylines that run both ways. The colourful Starburst Wild symbol expands and launches a respin whenever it appears. The galactic music and orbital sounds of the reel spins give a soothing effect to help you relax and enjoy the gameplay of this sparkling slot. The Starburst Wild Symbol is a star with 8 different coloured points and a white centre. It can appear anywhere on reels 2, 3 or 4 and substitutes for all symbols. If it lands it will spread to cover the entire reel and trigger a maximum of 3 re-spins. If a new Starburst Wild appears during a re-spin, it will also expand and remain in place for another re-spin. A winning combination is when identical symbols appear on neighbouring reels along an active payline from left to right or from right to left, starting with the first or last reels. The symbols are BAR, the number 7, a Yellow gem, a Green gem, a Red gem, a Blue gem and a Purple gem. The multipliers for them are listed in the paytable and are applied to the Level number. The 10 paylines run from right to left and left to right which gives more opportunities to create winning combos. Having played Starburst for free, you are now ready to take on the online casinos with their play for real money option. Or browse the NeonSlots.com range of free slots to find more games with the Neon theme.